With a professional ClariVein catheter. with the latest methods for healing veins. Modern, quick and efficient way of treating veins. use the available phone on workdays between 09:00 & 17:00h. Why to choose Dr. Kiuchukov? Dr. Kiuchukov treats varicose veins by using minimally invasive surgery methods, which allow shorter or no hospitalisation period. 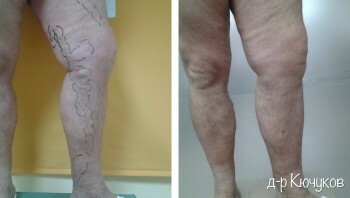 The laser method used by Dr. Kiuchukov for treating varicose veins (EVLA) results in a shorter recovery period and no scars after the treatment. Dr. Kiuchukov treats a large spectrum of blood vessels' diseases. He has a personal approach to every patient and his/her problem and offers each patient the treatment which will benefit them most. Dr. Kiuchukov specializes in the treatment of varicose veins and has more than 10 years of practice.